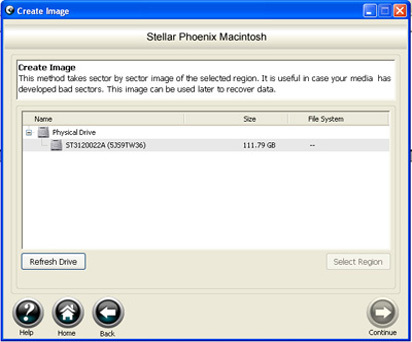 Stellar Mac is a user-friendly Mac data recovery software that salvages and recovers lost, missing, and deleted files from Mac hard drives attached to Windows based computer systems. The Mac recovery tool comes in with highly interactive user-documentation that makes it easy-to-understand without any prior technical understanding. Compatible with HFS, HFS+, HFSX, HFS Wrapper,and FAT file systems, the Mac data recovery tool incorporates intensive scanning methods to ensure absolute data recovery. 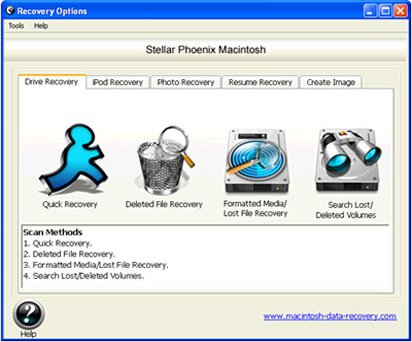 Stellar Mac is proficient Mac Recovery tool embedded with four different scanning methods – Quick Recovery, Deleted File Recovery, Formatted Media/Lost File Recovery, and Search Lost/Deleted Volumes – to recover lost files under different situations. 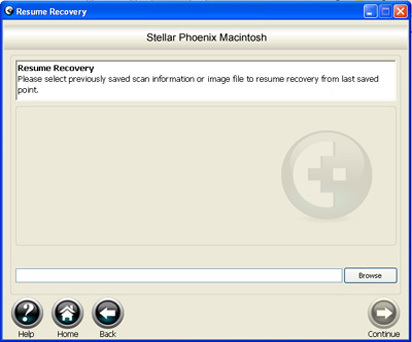 The “iPod Recovery” option in Stellar Mac recovers complete data from crashed or inaccessible iPod. 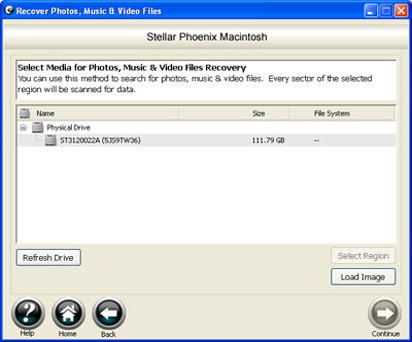 Using “Photo Recovery” option in Stellar Mac, the software recovers all types of lost, missing, or deleted pictures. The software is incorporated with an advance feature – Create Image – that creates a partial or full image of your hard disk. All the recoverable files are displayed in a tree-view format. The free downloadable trial version of the software allows to understand its complete functionality and preview all the recoverable files. Download the software and select your required option on the Welcome screen. A new dialog box “Select Volume” appears that allows you preview all the Mac hard drives attached to your Windows based system. In case of “iPod Recovery”, the iPod(s) connected to the system appear in the dialog box. Select the physical media from which you need to recover your data and click “Continue”. Scanning process starts displaying the recoverable files and folders. Preview and select the files and folders that you want to recover. Click Recover to retrieve all the selected files and folders. Save the recovered files and folders on your desired location. The Drive Recovery option on the Welcome screen provides four different options – Quick Recovery, Deleted File Recovery, Formatted Media/Lost File Recovery, and Search Lost/Deleted Volumes – to recover lost data under various scenarios. The iPod Recovery feature provides three options – Quick Recovery, Deleted File Recovery, and Formatted Media/Lost File Recovery – to recover lost data under different scenarios. The Photo Recovery option in the software searches the lost pictures, audio, and video files. The Resume Recovery option selects previously stored image file to resume recovery from last saved point. The Create Image feature is used to take a sector by sector image of selected hard drive region. The option is primarily used when your hard drive has developed bad sectors.